The most delicatessens South Indian Cuisine of Tamil Nadu district is Ennai Kathirikkai Kulambu.Various method of preparing this delicacy are used .It's a spicy dish which normally accompanied by briyani or just steaming rice with a drizzle of ghee which definitely make you fly in the air.Normally the spice are roasted before grinding...the tasty would be even better if it's roasted with castor oil.Whenever I get bored of having non-veg -my first choice would be this tangy and spicy kulambu. Roasted all the ingredients in a heavy bottomed skillet and grind into a very fine paste. Make sure that the coriander seeds are well grind. 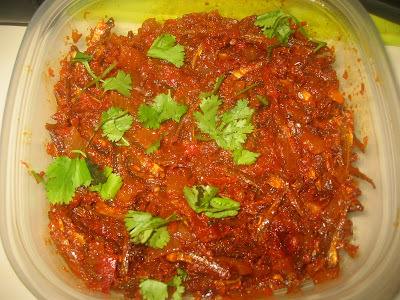 In a large bowl marinate the kathirikkai with all the ingredients and keep aside for 4-5 hours. Arrange the marinate kathirikka in a greased tray and grill them a 350° degrees for 15 minutes or till they become tender. Coat a wok with 5tbsp oil and splutter fenugeek seeds ,dried chillie and mustard seeds.Add curry leaves and chopped onions -saute till translucent.Next add the grilled kathirikkai with salt and saute. Keep the pan covered and cook on low flame for around 8-10 minutes till the vegetables are tender followed by grind paste and 1 cup of water and bring it to boil, stirring occasionally, until the gravy thickens. Adjust the level of salt and add the chopped coriander leaves and sprinkle some hing powder-remove from flame and serve with my choice of tomato rice. Hi Saras, I love the rich look of this dish. I am sure my Tamil hubby would love it and I am definitely going to try it soon. Thanks for posting a delicious recipe. Am just drooling rite now here...had it long back, tempting dish! Such a tempting dish and fab presentation!! Droolworthy!! First time here, you have a great space!! Following you! Pls do drop by mine when you have sometime! my mom used to make this ..never tried on my own...looks yumm..